Size 6 - $126.99 Only 6 left! Did you know there are reasons why pirates have all those accessories? For instance, pirates wore earrings because they believed they would treat bad eyesight, which any optometrist will tell you is baloney. The eye patches were a clever idea, though. By keeping one eye covered before a raid, pirates could storm the insides of ships they were looting without having to wait for both eyes to adjust to the dark! And do you know why pirates liked parrots? It’s because parrots are neat! They talk and they squawk, and if your home is ever invaded by nuts they’ll keep you safe. Some of their paraphernalia is a little more self-explanatory, of course. We don’t have to tell you why pirates liked swords and pistols, do we? And who would have the audacity to ask a seadog with a peg leg or a hand hook why they have one? Now, if you were going to be a pirate, why would you be anything less than a pirate captain? You would get to make all the most important pirating decisions: which ships to pillage, where to bury the booty, which beach to party on. 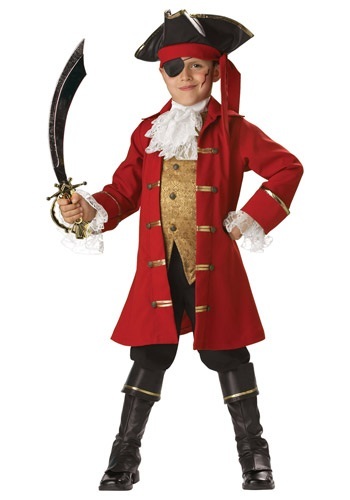 So if you want to be in charge, look the part with our incredibly detailed Pirate Captain Costume. It even comes with a sword, a very important tool when it comes to showing just who’s the captain around here!